Custom design carpet manufacturer, CM Hospitality Carpets, will debut their new Essentials Tool Kit at BDNY Trade Show this November. This year, our booth in New York will be a mosaic presentation of the patterns and colors included in the Essentials Tool Kit"
CM Hospitality announces their plans to showcase their new extensive design tool kit at Boutique Design's New York Trade Show in November 2018. The tool kit will consist of four binders designated by pattern category that will be a jumping off point for designers to use to create their own custom designs for their hospitality projects. "This tool will be so important to reiterate CM as a leader and THE go to company when designers are needing quality custom guestroom and public space carpet," says Lacy Price, Director of Marketing. Each of the architect binders will have 20-40 patterns in 6 standard color options that will be swatched in the book. With the use of Express Yarns (a list of 20 pre-selected solution dyed Genesis yarn colors), clients will be able to get custom carpet designs in 4-6 weeks instead of the standard lead time of 8-10 weeks.Each of the architect binders will have a removable printed catalog featuring patterns, room scenes, and colorways. "This year, our booth in New York will be a mosaic presentation of the patterns and colors included in the Essentials Tool Kit," says Price. "This series of architect folders will be added to and be a vehicle for CM for the next 5 years as we add additional pattern collections catalogs to the architect binders quarterly going forward." 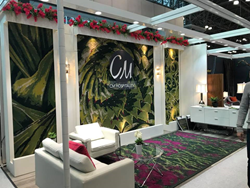 CM will host Booth 802, which is a corner booth near the entrance of the show floor, at the BDNY Trade Show at the Jacob K. Javits Center on November 11-12, 2018 in New York City. This will be the 6th consecutive year that CM has hosted a booth at BDNY.